conversionsConversions are a type of print filter that changes something about the print job, for example, from color to grayscale, or convert to duplex.—change something about the print job, e.g. from color to grayscale. restrictionsRestrictions are a type of print filter that ensures jobs meet certain criteria (denying those that don't). For example, you can restrict access to one or more printer, define a maximum number of pages allowed in a single job, or allow only duplex.—are used to ensure jobs meet certain criteria (denying those that don't). Each printer has its own set of filters. More details about conversion filters are available in Print conversion filters in detail. By default, restrictions apply only to restricted users. You can apply restrictions to all users by clearing the Restriction Scope check box. More details about restriction filters are available in Print restriction filters in detail. Important: PaperCut MF 18.2.0 or above allows users to change the settings of held print jobs at the device. However, printers with Filters and Restrictions, limit and control a user's ability to change the settings of held print jobs on such printers. If changes made to the settings of held print jobs contradict the printer's Filters and Restrictions, then the device displays an error, preventing the job from being released. The held print job is released only when its settings comply with the printer's Filters and Restrictions. For more information, see Changing print job settings at the MFD. For more detail see Advanced scripting (print scripting). Filters and scripts are applied at the printer level (i.e. on a per-printer basis). The following examples cover how to apply a filter/script to a single printer. Once a filter or script is applied to one printer, you can copy it to other printers (see Copy printer settings). Ensure you have a Students group in your domain (or equivalent) that contains all students. Ensure the Students group has been added to PaperCut so that it is displayed on the Groups tab. For more information about adding and removing groups see Groups in PaperCut NG/MF. Click the Filters & Restrictions tab. 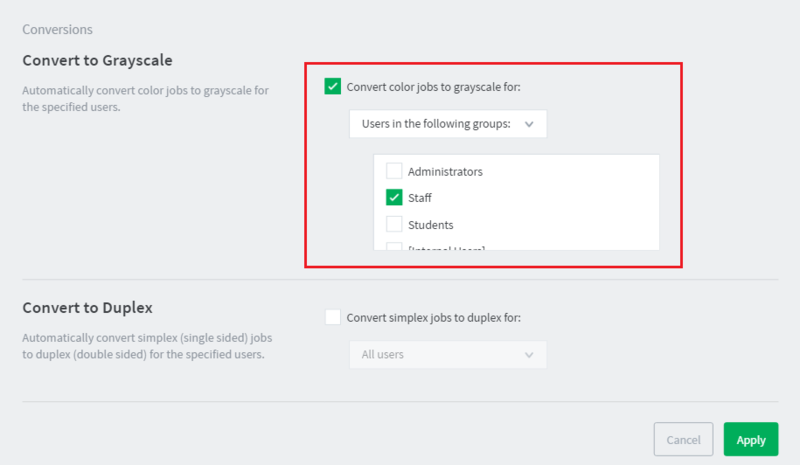 Select the Convert color jobs to grayscale for check box; then select Users in the following groups from the list. Select the Students group in the list of groups for selection. Test by printing a color job as a user in the Students group. Printing of emails is a prime candidate for reduction of paper and printing costs. Printing of emails in color (when the colour is being used for blue links and email footers) is doubly so. Having PaperCut automatically convert emails to grayscale requires a printer script as multiple factors are taken into account. The logic would read: when a user prints and the print is an email, convert the print to grayscale. Find the recipe called Convert all email printing to grayscale; then click import next to it. Note the message at the top of the script about the method it uses to detect when an email is printed. Test by printing an email in color. More examples are available in the application by clicking Import Recipe on the Scripting tab. Conversion filters work by modifying print jobs on the fly. For example, rather than denying color printing access and asking the user to print again (as is done using a restriction filter), a conversion filter can convert the job to grayscale automatically. Use print scripts for more advanced conversion functionality. For more information, see Advanced scripting (print scripting). After enabling a conversion filter on a new printer model it is always a good idea to perform a test to ensure it is working as expected. Processing is faster as there is no need to take a copy of the job. When jobs are re-submitted the new job might look unusual (the owner is SYSTEM, the document name has a special code in it). Using the PaperCut port avoids this and any potential confusion from administrators about what those jobs are. There is no need to disable the advanced printing features option on the print queues. Without the PaperCut port this option can cause problems with watermarkingWatermarking is a feature that allows you to print a small portion of text to the top or bottom margin of every page. Typical uses of watermarking include adding a username to the bottom of every page to help identify the owner, writing job metadata in the footer such as print time, printer or document name, and applying a digital signature to help track and verify documents. and other advanced features. When the PaperCut port is used it can cater for this option being enabled. Processing is more robust. Without the re-submission there are less steps, so less things to go wrong! Re-submitting can alter job ordering and priority (a feature of Windows print queues). Using the PaperCut port avoids this. For information about setting up a new or existing printer to use the PaperCut port, see Windows printer queue configuration. Changing the printer port is not required on other platforms such as Mac, Linux or Novell as the same limitations do not apply. This section is not applicable if your print queueA print queue displays information about documents that are waiting to be printed, such as the printing status, document owner, and number of pages to print. You can use the print queue to view, pause, resume, restart, and cancel print jobs. is using a PaperCut port (see Using the PaperCut printer port for conversion filters on Windows (Advanced) for details). Print conversion filters work best with open standard languages such as PostScript and PCL. Other manufacturer specific and GDI based languages might be supported, but most of all it's important that print jobs spool in the printer's native language, and not the "EMF" format. If your print serverA print server is a system responsible for hosting print queues and sharing printer resources to desktops. Users submit print jobs to a print server rather then directly to the printer itself. A print server can be a dedicated server but on many networks this server also performs other tasks, such as file serving is running Windows and documents are printing using the EMF language (the default), then conversions will not take place. Turn off (disable) the option Enable advanced printing features. Test printing and check the printer language to ensure that it is now something other than EMF. When experiencing problems with print conversion filters and there are new driver versions available for your printer, updating might resolve issues with the driver that caused conversions to not work. If the other troubleshooting steps do not assist with a print conversion filter related problem, feel free to contact the PaperCut support team. Please include information about the make, model and driver for the printer you are using. Many printers expect print jobs to be on a single size of paper, or maybe two sizes if the printer has multiple paper trays. A non-standard size causes the printer to enter a manual load state causing the queue to halt. PaperCut NG/MFFilters & Restrictions tab allows SysAdmins to select the allowed sizes. Non-standard sizes are automatically deleted before they're sent to the printer. It's an effective way of reducing one of the most common causes of queue jams. Many inkjet printers have very low throughput rates. A large color document can hold up a queue preventing other users from getting their "fair share" of print time. By setting an upper page count via the printer's Filters & Restrictions tab, network administrators can prevent large print jobs. The page count forces users to split up large documents and allows other users access to the printer. PaperCut NG/MF can also monitor the print queues and automatically delete duplicate print jobs. This option is useful on networks with novice users. New users often "double click" an application's printer icon causing two identical print jobs to be sent to the queue. This wastes paper and users' print quota. Network administrators can enable duplicate job detection via the Filters & Restrictions tab. A popup message warns the user and the duplicate job is removed from the queue. This option can affect multiple prints from Microsoft Excel and some other applications. Users wanting to print multiple prints from Excel might need to reprint the document 30 seconds apart. When printing to a hold/release queue, the filter does not apply until the jobs are released, not at the time of submitting the print job. Consider whether this Filter and hold/release queues are the workflow you require for your organization. You can set restrictions to define a maximum cost per job. 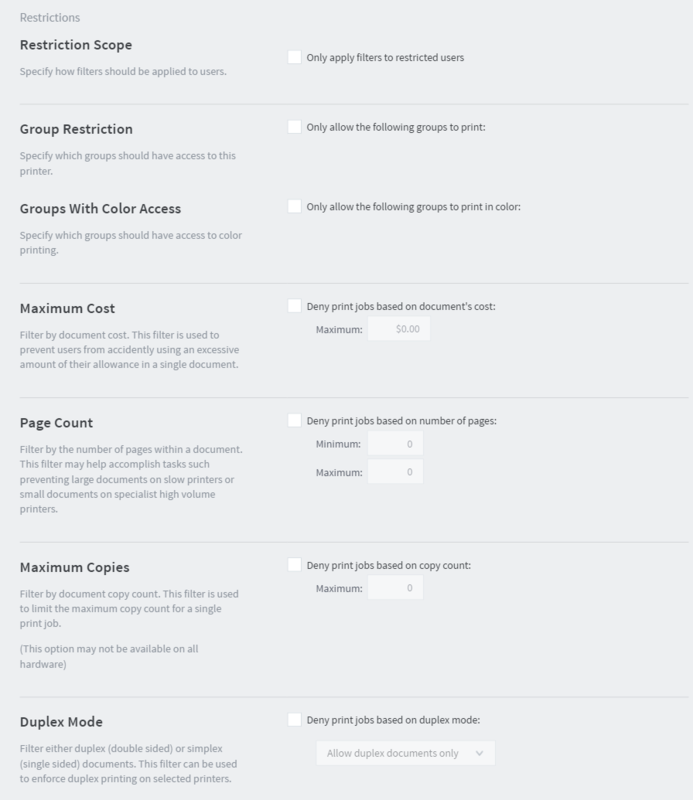 This prevents users from accidentally spending all their credit/quota in one print job. There are many reasons why users should not print certain files. For example, maybe a report from the accounting application consists of 400 pages. Users might not be aware of this and "accidentally" print the report expecting only a few pages. You can configure PaperCut NG/MF to match this document via its name and automatically delete it from the queue. Use the Filters & Restrictions keyword filter to implement this functionality. Additionally it's also possible to filter documents based on file extension by entering a keyword, such as .htm or .pdf. This is not a security option. It is easy to circumvent the filter by renaming the document. Some systems might not even report type information! On the print server, create a print queue. Share the print queue as normal. Add the printers to PaperCut NG/MF and define appropriate costs. In the Groups With Color Access area, select the groups that should have access to color printing via restriction. For example, you might want to allow only staff to print in color. This method uses two print queues, each with different driver defaults. One queue is set to grayscale only and the other have full color access. Group access is used to control who has access to the color queue. On the print server, set up two print queues that point to the same physical printer. Call one queue Grayscale Only and the other Color. You now have two printer icons (logical printers) each connected to the same physical printer. Share the printers as normal. Set Windows access permissions on each queue as required. Ensure Users who require color access can print to the color printer and other users can access to the "black and white" only printer. select the Deny print jobs based on color mode check box. select Allow grayscale documents only from the drop-down list. This method although being more complex to manage, sometimes offer better user experience as users do not need to select driver color and black and white options for each print. Monitoring of locally attached network printers. Central monitoring over Wide Area Networks (WAN) or VPN. These topics are an advanced subject and covered in subsequent sections. For more flexibility in filtering print jobs, one should consider the Advanced Scripting capability. Advanced scripting allows filtering on more more attributes of a print job or combinations of attributes. 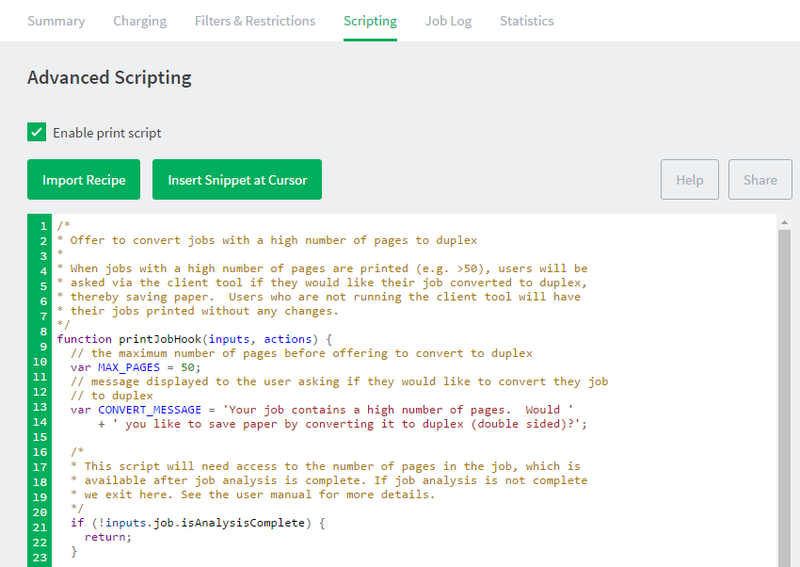 See Advanced scripting (print scripting) for more details.